Saturday was WWKIP day. Since this post is a bit late I’m sure you all already know about it. I was working so I couldn’t attend the Boston gathering, but I managed to KIP on my way there and back – it ended up being great for my trip home which was complicated by some sort of subway issues. I can’t believe how many comments I’ve been getting on them! The yarn is ONline Supersocke Savanne, and the colors are very nice. The stitch pattern is from Knitting Vintage Socks – the Ringwood socks in the book are mens’ half-hose, so I just made a regular sock size with the stitch pattern. 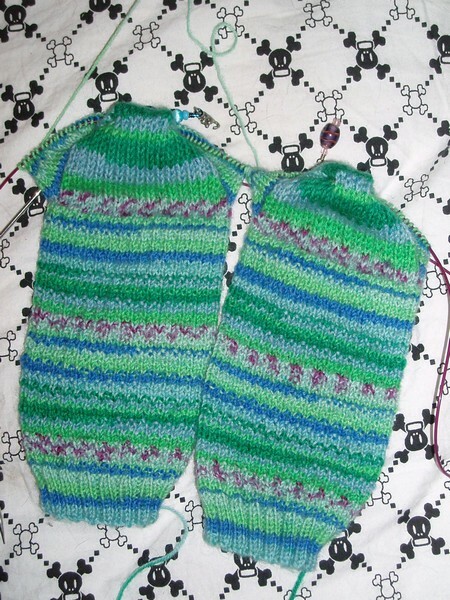 Yesterday I finished the gusset and have about 2 inches left to go before starting the toe. Hopefully I’ll finish up this week. 2 Comments | Scroll down or click here to add your own comment! They’re beautiful! I love the color combinations. I knit in public everywhere I go. Yesterday I knit at my retinologist’s office; I have macular degeneration (at 55!) and had to have another eye injection of Lucentis, which so far is preserving my sight, except for that I’d lost before the first injection. Older people there marvel that I can see to knit on size 1 dpns! By the way, the socks I’m knitting currently are my second pair of (black)hearted, which is my favorite pattern. These are in Claudia Hand Painted Yarns’ Red Wagon colorway; very festive!